1. Melt 1 tablespoon softened butter in 12-inch nonstick skillet over medium heat. Add onions, ½ teaspoon salt, and ¼ teaspoon pepper and cook, stirring occasionally, until onions are soft and golden brown, 15 to 20 minutes. Stir in garlic and thyme and cook until fragrant, about 30 seconds. Stir in wine and cook until evaporated, about 3 minutes. Off heat, stir in olives and 2 tablespoons basil; set aside. 2. Meanwhile, toss zucchini and yellow squash with 2 teaspoons salt in large bowl. Microwave, covered, stirring halfway through microwaving, until slightly softened and some liquid is released, about 8 minutes. Drain in colander and let cool slightly. Arrange zucchini and yellow squash on triple layer of paper towels, then cover with another triple layer of paper towels. Press slices firmly to remove as much liquid as possible. 3. Adjust oven rack to middle position and heat oven to 450 degrees. Grease bottom and sides of 13 by 9-inch baking dish with remaining 1 tablespoon softened butter. Combine panko, Parmesan, and 1 teaspoon pepper in bowl. Evenly coat baking dish with 6 tablespoons panko mixture. Stir melted butter into remaining panko mixture until well combined; set aside. 4. Arrange half of squash in prepared dish and season with pepper to taste. 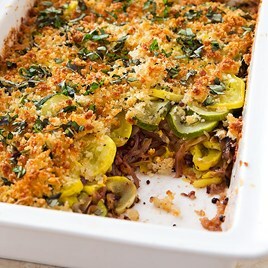 Sprinkle ¼ cup panko mixture evenly over squash. Spread onion mixture in even layer over crumbs. Arrange remaining half of squash over onion mixture and season with pepper to taste. Cover with aluminum foil and bake until just tender, about 15 minutes. 5. Remove dish from oven; discard foil. Sprinkle remaining panko mixture evenly over top. Bake, uncovered, until bubbling around edges and crumbs are golden brown, 10 to 15 minutes. Transfer to wire rack and let cool for 15 minutes. Sprinkle with remaining 2 tablespoons basil. Serve.